Blegh. I sit slumped in my chair at my aunt’s dining room table, a bowl of steaming black mush in front of me. “Mimi, eat it. It’s good luck,” Aunt Vovi persuades. 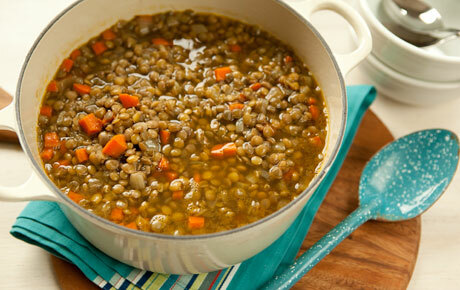 I morph into a ten-year old and hold my nose while taking tiny bites of the “lucky” lentil soup, making slurping noises to trick Auntie Vovi’s ears into thinking I’m eating more than I am. A staple of Italian holiday cuisine, the lentils are small, flat, and round—reminiscent of coins—and Italians eat them for prosperity, good luck, and wealth in the New Year. Staring into the black abyss of soup in my bowl, I know this is one Italian holiday tradition I don’t like. A sticky sausage made of pig snout, cotechino, is another festive Italian treat, served alongside roasted potatoes and onions. I eat just enough to warrant dessert: Panetonne and Pandoro, sweet holiday breads made with almonds and candied fruits. This time of the year is peppered with holiday food traditions and rituals all across the world. We choose special menus for certain days. We invite friends and family to share in the abundance. We deem lifting forkfuls of pumpkin pie into our mouths as exercise (“Ok, just one more sliver!”). We take tryptophan-induced snoozes at the dinner table. No matter what you celebrate, from Diwali to Lunar New Year, the holidays (excuse me, The Holidays) invite us to embrace our cultures in terms of food, attaching sentiments and meaning to what we eat. These generations-old traditions from around the world might help you add some new ones into your holiday season. Greece and England share an interesting holiday food tradition that couples as both a choking hazard and a dental nightmare. A coin is hidden in a festive cake both for Vassilopita, Greece’s New Year, and in Britain’s traditional Christmas pudding. The one who finds the coin and retrieves it before swallowing it, choking, or chipping a tooth will enjoy success and wealth in the coming year. In Tibet, however, the opposite is true. Tibetans hide a piece of coal in their guthok for Buddhist New Year. The person who gets the coal is said to have a dark soul and an evil heart! Lunar New Year is one of the most festive holidays celebrated in many Asian cultures and typically lasts several days. China and Vietnam celebrate Lunar New Year on the same day, falling sometime between mid-January to late February. 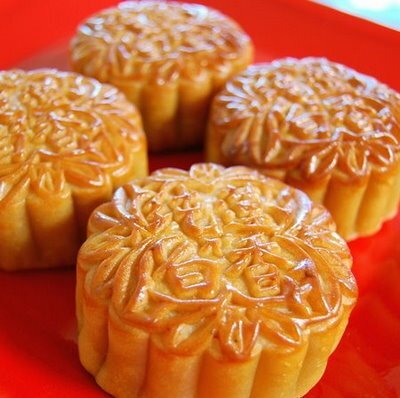 In China, however, the holiday is called “Chinese New Year.” The celebration is a time for “sticky rice with pork” made into the shapes of squares or rolled into balls and Moon cakes are the most popular dish . In Vietnam, these cakes are called banh trung thu and are typically filled with savory meats, sweet coconut, or bean paste. Moon cakes and sticky rice balls wrapped in bamboo leaves are popular in Taiwan as well. In the Philippines, celebrators eat noodles for a long life and round food items to symbolize coins in hopes of gaining money and success. Korea’s Winter Solstice is the time for dduk, a glutinous rice cake served as dessert with fruit and nuts inside. 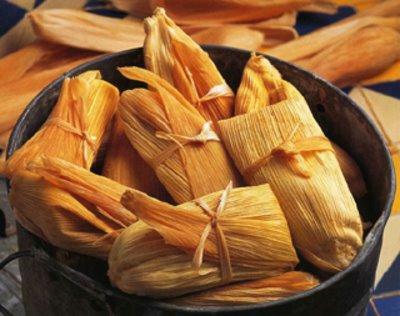 In Mexico, tamales are the traditional holiday food. In Guatemala, these tamales negros, or “black tamales,” are sweet and eaten at midnight on Christmas Eve. Another traditional Guatemalan dish, Fiambre, is served in celebration of Dia de los Muertos, the Day of the Dead, which is a day to remember and give thanks to ancestors. Cooking and baking breads is traditionally part of Ethiopian celebrations during this time of the year. Doro wat, a spicy chicken stew, is the special holiday treat in Ethiopia, eaten with traditional Ethiopian bread, injera. One Italian tradition that has made its way into Spanish and Filipino cultures is eating grapes when the clock strikes midnight on New Year’s Eve. The Spanish and Filipino traditions suggest twelve grapes for the twelve months of the upcoming year. Italian tradition suggests eating as many grapes as you can–the more grapes, the more upcoming success. Be forewarned: downing as many grapes as you can post-Happy New Year toast might make you look like a weirdo. Let’s stick with twelve. No matter what your holiday food traditions are this season, it’s never to late to add some new ones into the mix. Pass the pig snout, please. Mimi DelGizzi is an incoming Friedman student practicing her 100m dash so she can sprint away from the lentil soup that will inevitably stare her down at the holiday dinner table again this year.